12 Volt 300 Watt True Sine Wave Power Inverter with GFCI and Anderson Quick DC Connection. Reliable operation and a very heavy duty product built for demanding applications like mobile offices and laptop computers. Great clean power is supplied from this DC to AC power Inverter. High End GP 300 Pure Sine Wave Inverter with GFCI. This GFCI (Ground Fault Circuit Interrupt) outlet provides safety type outlet that is often found in bathrooms and kitchens. This is our staple power inverter for most small applications. We sell this inverter because it is heavy duty and reliable. It weighs in at about 11 pounds. That weight is from the amount of components required tom make a quality 300 watt power inverter. We have looked at many of the competitors 300 watt inverters on the market and we found that most are about 3 to 4 pounds in weight. We have put some of these inverters on our test bench and found several labeled as sine wave were not true actual sine wave. We also had one particular brand fail on us on the test bench. (Sorry Not Mentioning Names) You won't have any quality or Waveform issues with the Go Power Sine Wave Power inverters. 300 watts of Continuous Pure Sine Wave AC Power from 12 Volt DC Power Source. This is enough power to run most mobile office setups, TVs, and Entertainment systems. For smaller loads under 300 watts, the GP Sine Wave 300 is perfect. Good for small loads that need the clean power of sine wave. The Remote Port on this power inverter is the Green Connection located on the Inverter's front face. Also note that the power Switch allows the inverter to be switched to ON or OFF or REMOTE POWER INVERTER MODE. 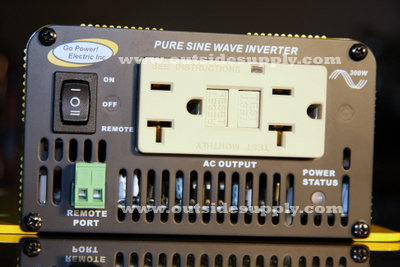 This is the ideal sine wave power inverter for the following applications:This is a picture of the DC quick connection being used plugged in on the back of this power inverter. Here is a great video on choosing the right inverter for your application. 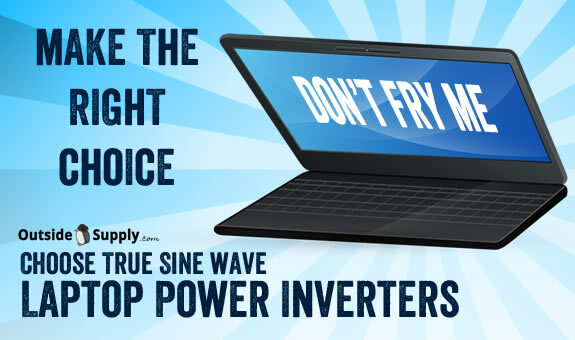 It is called Why Buy A True Sine Wave Power Inverter?